Indonesia is quite simply one of the best scuba diving destinations in the world! It offers many world class dive sites and an outstanding array of marine life. Indonesia is the biggest archipelago in the world with over 17000 islands and makes up about 20% of the coral worldwide! 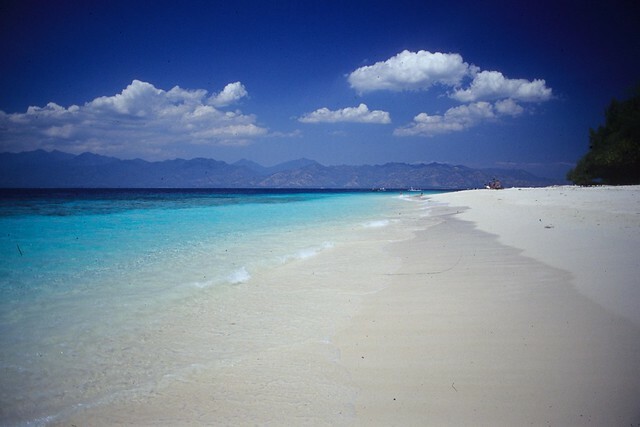 It is located in South East Asia between the Pacific Ocean and the Indian Ocean in the centre of the coral triangle. To plan my trip I usually use this guide book as they have great maps and give a good overview of Indonesia with the best places not to be missed. An Indonesia road map is also very useful. I have this one and really likes it. I usually don’t book in advance my hotel when I am travelling in places I know very well such as Bali. However, I really advise you to book at least the first nights of your trip to have a place to stay right after you land. This will save save you time, stress and even money. If you travel during the peak season such as July August and December January, it is wise to book all your hotels in advance as room rates tend to double or even triple during these periods. I usually use this website as they generally have the best fares in South East Asia. Please do not forget to take a travel insurance that includes scuba diving. I really like this one as they offer a worldwide cover and include all the “risky” activites such as Diving, Trekking, Scooter, Surfing, snorkelling and so on. I usually use this website to book in advance my hotels in Indonesia as they usually have the lowest rates I find. I like it because it's free to cancel and change the dates. Indonesia is a cheap destination to travel. You will find all types of accommodation, from the basic backpacker guesthouse to the top end luxury resort on some private islands. Hotel rates tend to double or even triple during high season (July, August and December, January). On the contrary, during the low season you can bargain and get a luxurious room for a very low price :-). The climate is tropical all around the country. That means hot and humid all year round. Indeed, most of the country is covered with tropical rain forest. During the monsoon which runs in most part of the country from October to March, there is heavy rainfall but they usually don’t last more than 2 hours. Excellent diving can be found year round. You will just need light clothes and a light sweatshirt if you plan on going to some of the mountains or volcanos. Indonesia is a Muslim country so every traveller should wear appropriate and respectful clothing especially when visiting temples and mosques. Bali is Hindu so you can dress how you like most of the time except in the Temples. There are no necessary vaccinations that you are required to get for Indonesia. Anti-malaria tablets can be useful if you travel to remote places like Borneo or Papua (Raja Ampat) so please consult your doctor for travel advice. If you stay on Java and even more on Bali and the Komodo Islands, the risk of Malaria is very low but don’t forget your mosquito repellent! Never drink tap water and it is better to come prepared with a little first aid kit containing anti-diarrhea pills and pain relief etc. Indonesia is a very safe country! Although in the past there have been a few terrorist bombings depicted in the media, the day to day safety is really not a concern. However, like everywhere in the world it is recommended to take care of your belongings while travelling and use common sense. The main safety issue is the road safety. You have to be extra careful if you plan to drive a car or a motorbike. Driving rules do not seem to exist here so keep your wits about you! If you are planning an upcoming dive trip or travelling to Indonesia, it is a really good idea to invest in travel insurance for scuba diving, because you never know what could happen and when you might need it (because accidents do happen!). I recommend this diving insurance as they offer worldwide coverage and focus on providing scuba divers a quality insurance and medical assistance service. 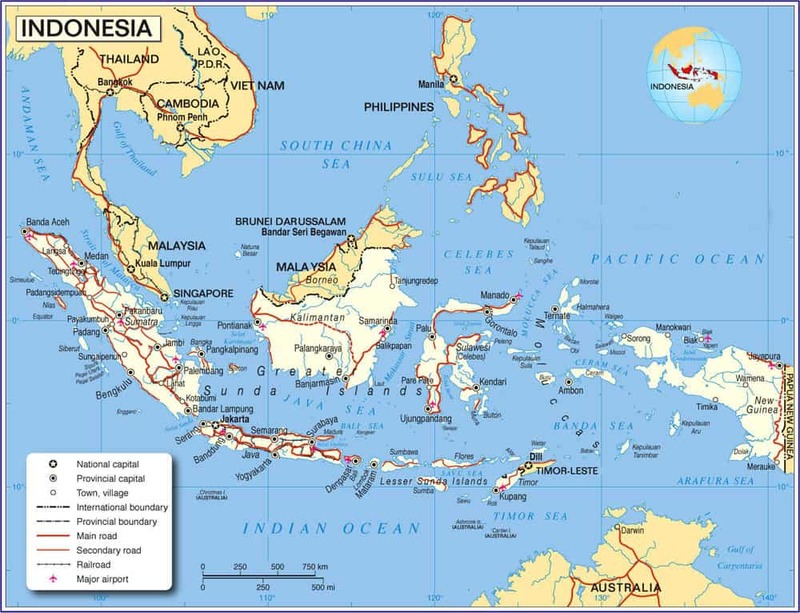 Indonesia is located in South East Asia, South of Malaysia and North of Australia. It is a huge country with around 17 000 islands! How to get to Indonesia? There are numerous ways to travel to Indonesia. The main entry gates are the international airports of Jakarta, Bali, Manado and Makassar. There are many connections with all South East Asia main cities. If you fly from Europe, flying time will be around 14 hours with a stopover in Singapore, Kuala Lumpur, Dubai or Doha. Indonesia is a huge archipelago. The most popular and fastest way to travel between the numerous islands is by airplane. There are many companies, with the most reliable being the national company Garuda airlines, along with the very good low cost airline Air Asia. The other main airlines are Merpati, Batavia and Lion Air. If you have plenty of time, you can also find cargo ships travelling for example from Jakarta in Java to Borneo or Sulawesi. You can travel by train. For example, it is quite handy to land in Jakarta and take a night train to Surabaya and Yogyakarta to explore the island of Java. Buses are also available but you may want to avoid them for long distances as travel times will be long and can often be uncomfortable and packed with people. Some people may prefer this type of travel for the cultural experience with locals. The bemo, is the local minibus which are perfect for short rides but better to know where you are going! Rent a car with a driver might be the best way if you can afford it. It is not overly expensive (around IRD 300 000, depending on the location) and is a very comfortable and relaxing way to travel as you don’t have to worry about navigation and driving. In many places, like Bali, you could also rent a scooter or small motorbike. 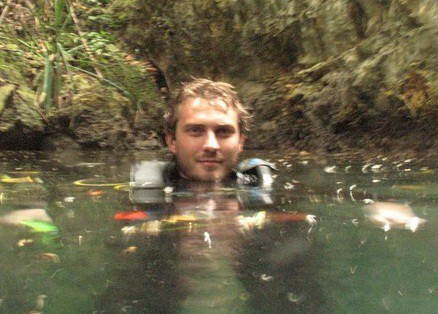 It is a very good way to explore hidden places that most tourists will never see so it does give you a bit more freedom. Always be extra careful when driving and always ask for a helmet. It is also advised to have an international driving licence from your own country beforehand. Wakatobi has some of the finest coral in the world, amazing biodiversity and one of the best places in the world for macro photography! On the right day, the visibility can be outstanding! Diving in Indonesia will suit every diver's hopes and desires. In a land of opportunity, dive spots range from those suited to beginner divers wishing to learn in perfect easy conditions to unexplored dive sites with fierce currents for those more experienced divers looking for a challenge. 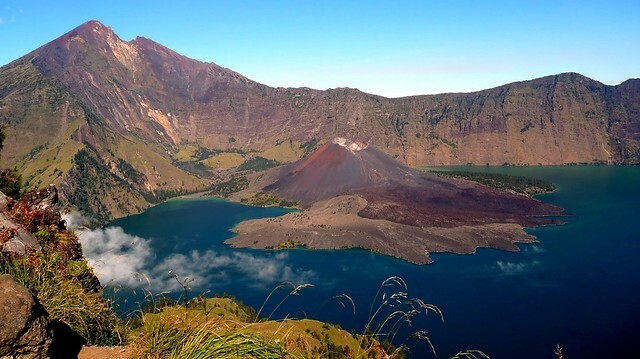 Have you been travelling or backpacking in Indonesia? Please consider sharing your experience by leaving a comment below! Divezone has complete information about scuba diving and snorkelling in Indonesia. For information about the best time to dive, list of fishes spotted in these waters, please check our Indonesia Diving Review.